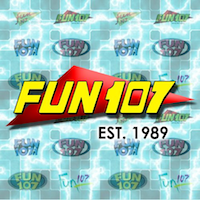 “Fun 107” (107.1 WFHN Fairhaven/New Bedford, MA) certainly lives up to its relatively unique name, even to this day. In the late 90’s, it was one of the best-sounding stations around, offering a Rhythmic-leaning Mainstream CHR format that even included a few dance/rhythmic classics. Production-wise, the enthusiastic delivery of the voice guy (can’t recall his name — can anyone help?) and jingles were outstanding. This aircheck is from an early evening in late May 1999. EDIT: The voice of the station was Pat Garrett. Thanks Jeremy Andrews for the info!